What is subclavian artery thrombosis? Subclavian artery thrombosis is a blockage of the subclavian artery by a blood clot. Injury to a vessel and narrowing due to fatty plaques (atherosclorosis) are common predisposing factors of a blockage of an artery with a blood clot. This is typically seen with older people. However, subclavian artery thrombosis can also arise in younger people, particularly athletes, when muscles around the artery compresses it and increases the chance of clot formation. Depending on the degree of blockage, a subcvlavian artery thrombosis can lead to a stroke. 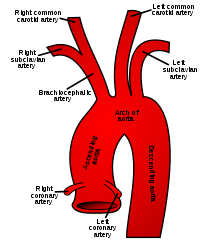 The aorta is the largest artery in the body. It arises from the left side of the heart, curves around (arch of the aorta) and then continues downwards. The subclavian arteries arise either directly or indirectly from the arch of the aorta. There are two subclavian arteries – the right and left. It is located in the upper chest. The left subclavian artery either originates directly from the arch of the aorta. The right subclavian artery arises from the brachiocephalic artery which is a branch of the aorta. Vertebral artery – supplies blood to the brainstem and portions of the brain. Internal thoracic artery – supplies blood to the chest wall and breasts. 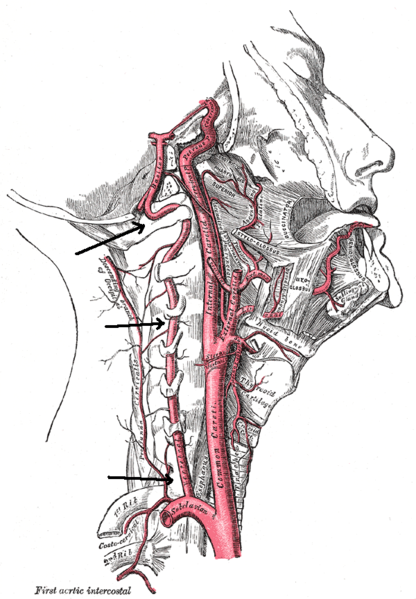 Thyrocervical artery – supplies blood to through its branches to the thyroid gland and neck. Costocervical artery – supplies blood to the muscles between the ribs and neck. Dorsal scapular artery – supplies blood to the upper back muscles. The last part of the subclavian artery continues to become the axillary artery. 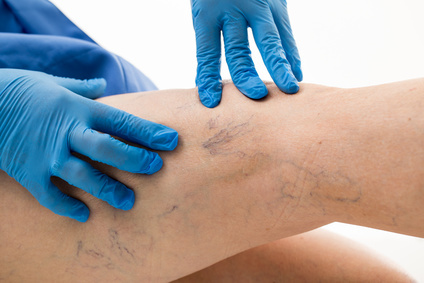 There are three reasons for blood clots to form at a site, known as thrombosis. Either the blood flow is sluggish or turbulent, the inner lining of the artery is damaged or the blood clotting process is abnormally triggered (hypercoagulability). Clotting is an essential process to plug any breaks in a blood vessel. This prevents blood loss. Various clotting factors (chemicals) remain inactive in the bloodstream but are activated with in certain conditions. However, under any one of the three conditions mentioned above the clotting process is initiated. Movement causing muscles around the subclavian artery to press against it. Bony protrusions that can compress the subclavian artery. Enlarged muscles around the subclavian artery that apply force on the artery. However, in most of these instances there are underlying arterial abnormalities that predispose it to clot formation. This is mainly due to atherosclerosis and hypercoagulability of the blood. While the symptoms can vary depending on which part of the subclavian artery is occluded with a blood clot, the most common symptoms of thrombosis in this artery includes upper extremity symptoms and central nervous system symptoms. This arises because the subclavian artery continues to become the axillary artery and then supply blood to the arm. The central nervous system symptoms are a result of disruption of blood flow through the vertebral artery. These symptoms are more likely to occur in the acute setting, meaning when the artery becomes suddenly occluded with a blood clot. In milder cases, particularly in the chronic setting, there may be only muscle cramping of the upper extremity. It is more likely to be noticed in laborers who undertake strenuous physical activity with their arms and is especially noticeable when raising the arms above the head. These symptoms arise when the blockage in the subclavian artery occurs just before the origin of the vertebral artery. This condition is known as subclavian steal syndrome (SSS) and neurological symptoms accompany the arm symptoms. Blood flow that is hampered, although not blocked altogether, tends to cause the formation of a blood clot at the site. The symptoms of subclavian artery thrombosis, particularly where there is a combination of arm and neurological symptoms, should raise suspicion about the condition. A medical history indicating a tendency for these symptoms to arise with arm movements is more likely to be indicative of subclavian artery thrombosis. However, further tests are necessary to conclusively identify an obstruction and exclude other conditions that may cause similar symptoms. Lab tests are primarily used to diagnosis any abnormalities in the blood chemistry and identify problems with the blood clotting function. Imaging studies such as arteriography are the best tools to diagnose any occlusion of the blood flow in the subclavian artery. Other studies such as a CT scan or MRI are useful for visualizing possible causes of artery compression. Echocardiography uses ultrasound waves to asses the heart which may be the more likely origin of any mobile blood clots (emboli) that can block the subclavian artery. The aim of the treatment is primarily to undo the blockage – the clot immediately and the underlying narrowing as soon as possible. This can be done with a combination of medication and surgery, although surgical procedures are not always necessary. Clot busting drugs (thrombolytic therapy) are necessary immediately. It can be delivered at the site of the clot through catheter-guided procedures. Anticoagulants are then utilized to prevent new clot formation. However, it does not address the underlying problem of narrowing of the subclavian artery to specific causes. This often needs to be done surgically. The three main approaches to surgically treating the underlying cause of subclavian artery thrombosis is angioplasty and stenting, bypass and surgical removal of any compression. Angioplasty is the procedure where the artery is unblocked by physically removing the cause of the narrowing. A stent is then placed at the site to ensure that it keeps the artery open wide. Bypass utilizes a synthetic tube to reroute blood between the carotid and subclavian artery beyond the site of the obstruction. Excision is the surgical removal of muscle or bone that is externally compressing the subclavian artery. If there is no permanent damage or tissue death of the areas receiving blood from the subclavian artery, then surgical intervention can offer a significantly positive outlook. About 90% of patients will be symptom-free and not have any major recurrence of narrowing and clotting after 5 years provided that any causative risk factor has been removed or discontinued, particularly lifestyle measures like cigarette smoking. Patients with elevated blood cholesterol levels (hypercholesterolemia) need to be treated with cholesterol-lowering drugs for life in most cases. This reduces the chances of fatty plaques building up in the artery (atherosclerosis).